The day I showcase a build over on The House of Wood! It’s something you won’t have seen on this blog – and it has my favourite features – function, form and it’s easy-to-make. 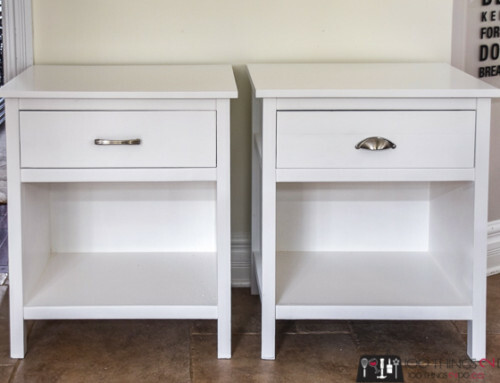 I figured that since Jen was sharing one of my builds to her readers, then it’s only fair that I showcase one of her builds to you guys – so today I’m showing off these Pottery Barn knock-off nightstands. 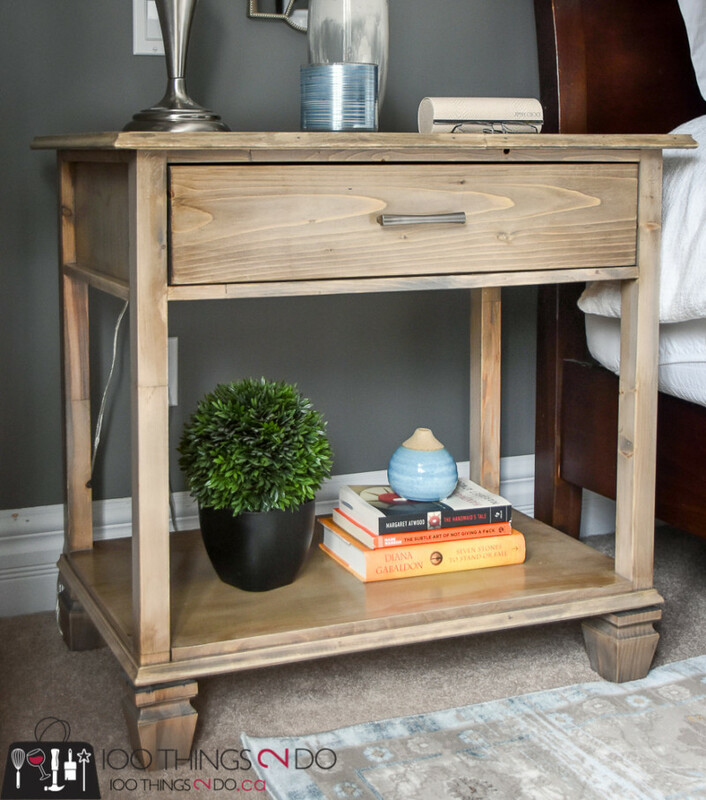 I used Jen’s plans to build this DIY nightstand, so if you’re looking to make your own, or create other amazing projects with her free builds, you should really click over. This is the rendering I received from Modsy with regards to my master bedroom makeover. Last week I showed you how I refinished a Kijiji dresser to mimic the look of the Pottery Barn dresser from photo 3. As it turns out the nightstands in photo 2 are also from Pottery Barn and are called the Sausalito extra-wide bedside tables…. and my bestie Jen had plans on her blog to create those very same nightstands! Woohoo! 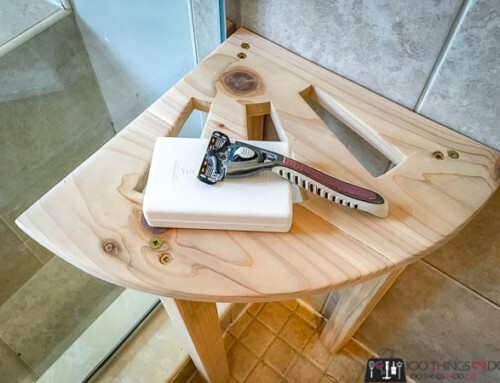 All of the lumber and plywood that I used for my DIY nightstand was from my local home improvement store – so really inexpensive (which also means lesser quality). In hindsight, I would have spent a bit more to get better cuts of wood, but I don’t think you’ll notice all the little blips, bends and knots. It’s just when you’re really close to the project you see the tiny details. I used a different trim from Jen’s building plans, and a slightly different leg as well. Once my stain had set, I applied (and wiped off) a wash of BM’s Briarwood paint (3 parts water to 1 part paint) over top. This evened out any areas that took more of the stain than others. At this point I added one coat of clear polyurethane to the DIY nightstand. To give my wood a bit more depth and interest, I dry-brushed here and there with Minwax Special Walnut stain and wiped it down so the shading was very subtle. By applying it after a coat of poly you have more flexibility to add and remove than you would if you applied it right over your wash. I finally finished my DIY nightstand with 2 more coats of clear polyurethane. Jen’s DIY nightstand and the Pottery Barn Sausalito version both have two drawers (or the appearance of two drawers) in the upper section. 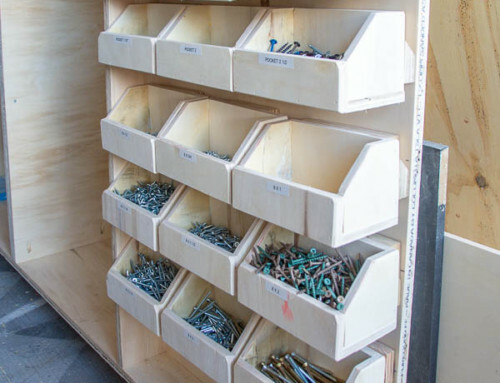 I decided to go with one long drawer with a single handle in the middle. My reasoning was that when you’re in bed and want to reach over to get something from your drawer, you won’t want to have to use two handles to open the drawer smoothly. I was concerned that pulling on one handle would make the drawer slide on an angle and make it difficult to open. Having the handle dead-center should keep the slide smooth and even on both sides, even with a one-handed-laying-in-bed pull. I made one other alteration to Jen’s plans for this DIY nightstand and that was to incorporate a small opening in the back of the drawer to let a power cord run through it. This was so that I could attach a power bar to the inside of the drawer to charge my iPad. I could run my lamp cord in the back of the DIY nightstand as well so that only one cord would show behind the open back, but I have one plug that is run by that little light switch on the wall, so I wanted to keep my light to that socket. The bottom shelf can hold books and decor, a throw quilt for those extra-cold nights, or a basket to house all the throw pillows from the bed. That’s ¾” plywood and regular 2″x 2″s – I’m really pleased with how evenly the stain/finish turned out! I still have my bed frame to makeover, but building these two nightstands made a substantial change in my master bedroom. 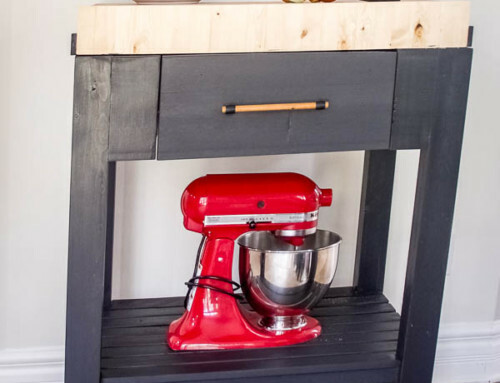 If you are a novice builder, you could totally make this DIY nightstand yourself – although the drawer just about ‘made me lose my mind (up in here, up in here)’. If you are an advanced builder, you could trim this out even more, router edges, bring in a better wood etc. 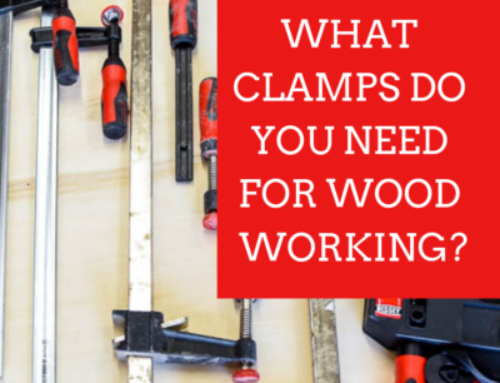 The plans are easy to follow, and leave you to make changes to fit your skill level. Total = $443.39 or $221.70 per DIY nightstand. I’m getting so close to my Modsy design! Now it’s time to click over and see what I’ve built for Jen at The House of Wood! Brilliant, as always… You have the gift!